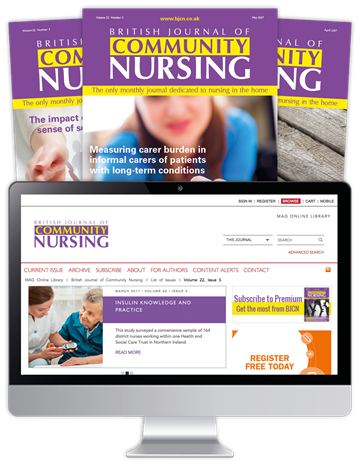 British Journal of Community Nursing (BJCN) is the leading peer-reviewed journal for district and community nurses. Every month, the journal provides specialist professional information on all areas of practice - such as long-term conditions and palliative care - delivering clinical expertise for nursing in the home. As of April 2019, BJCN will no longer be available to NHS staff via Heathcare Databases Advanced Search (HDAS). Order you subscription today and ensure you continue to receive access - while saving 20%. Subscribe now to save 20% on your subscription. Order with code BJC19D to claim this special offer. Select your subscription option below. Your discount will be calculated at checkout. Discount only available with annual or quarterly subscriptions. Offer ends 17th May 2019.